There has to be some joy in visiting the UK right now because the exchange rate for the Aussie dollar is crippling (more than two dollars to the pound!) 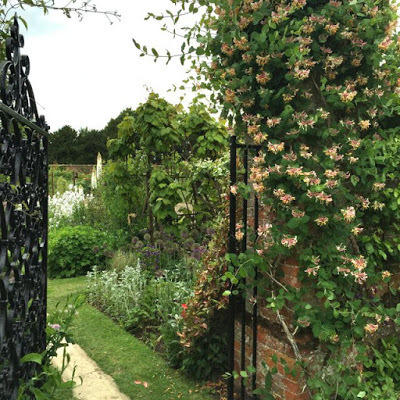 – and what better way to cheer oneself up but to visit some lesser known English gardens. For me, this is a pastime that never fails to do just that – cheer me up and inspire and delight at the same time. 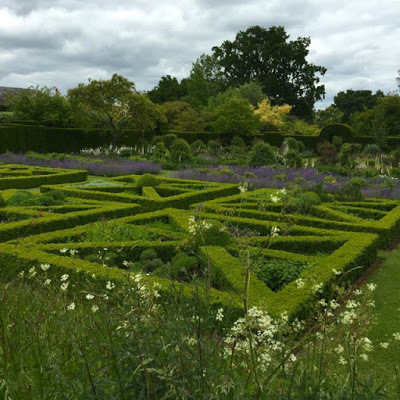 When I have visited a gorgeous garden, usually set around an equally lovely old building, I feel satiated – full up, as if I have eaten the most wonderful meal. Those of us in love with the beauty and joy of European gardens will probably already have been to some of the most famous ones in the UK like Sissinghurst, Kew, Wisley, Bodnant, Great Dixter, Hidcote and, while everyone should visit them once in their life, these not so well known ones also have so much to offer – they have their own beauty and unique histories but are a lot less commercialised and ‘packaged’ – and, there are rarely any crowds! My mother lives in a beautiful part of the world on the Stour River, bordering Essex and Suffolk, with access to lovely countryside, picturesque villages and valleys that have been havens of rural life for centuries. 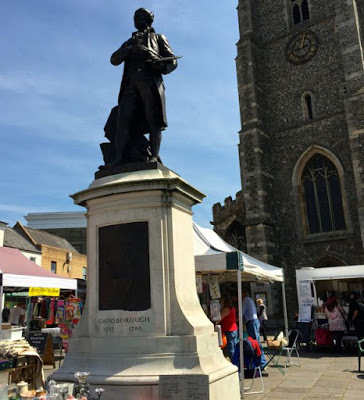 It was this landscape that was the birthplace and inspiration to two of England’s most celebrated painters – John Constable and Thomas Gainsborough. Travelling to Helmingham we passed through Sudbury where a statue of Gainsborough (1727-1788) stands in the centre of town and, on the day we were there, he was keeping a watchful eye on the bustling farmers market – something that time hasn’t altered over the three hundred years since he was born – Sudbury always having been an important market town. I bought the most delicious cherries, strawberries and pork pies and headed for Helmingham. The first thing that strikes you is the utterly romantic setting of this moated, Tudor manor house – almost Lewis Carroll like in it’s imagining – with swathes of wild meadow and grasses dotted with topiaried ‘blob’ bushes sweeping all around the house (reminiscent of the entrance to Great Dixter). Here and there a pathway has been mown through the meadow to help you with your happy wanderings – where I fully expected to see the Mad Hatter dashing along in front of me. This has been the home of the Tollemache family since 1480 – and they still live here – which means that, unfortunately, the house is not open to the public. 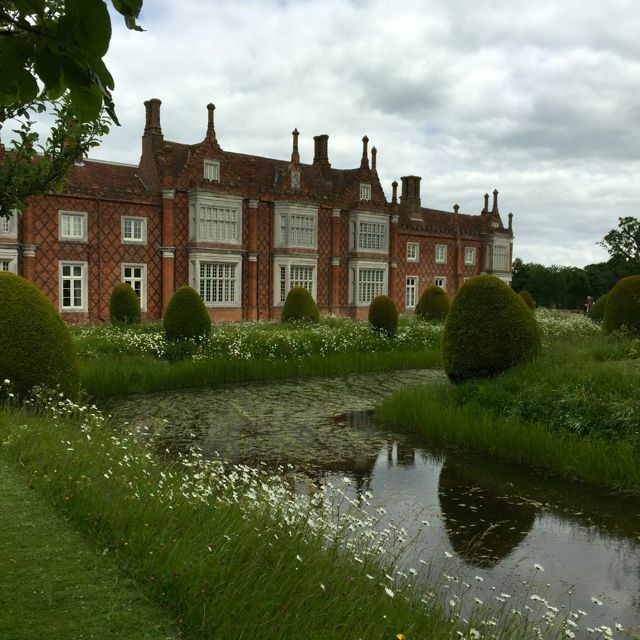 Beautiful in its design and construction, it is built around a central courtyard, has all the fancy Elizabethan brickwork, ornate chimneys and two working drawbridges – utterly entrancing and I was dying to take a peek inside! Helmingham, however, is best known for its fine garden (Grade 1 listed), which is regularly open to the public. It is also part of a larger estate of over 400 acres, with herds of deer, sheep, cattle, magnificent trees, woodlands, thatched barns and rural farmland. This is England and, if the English weather had been kinder, I would have loved to have taken a walk on the many of the public footpaths that criss-cross the estate and surrounding countryside (how I wish we had these in Australia!). 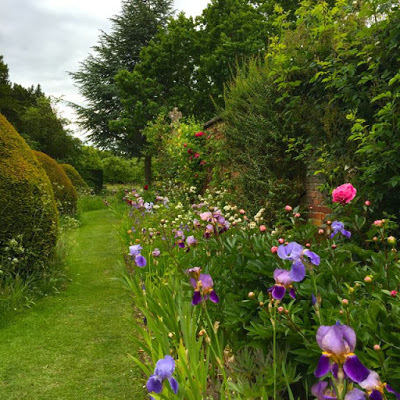 June can be one of the best times to go garden visiting in the south of England – you have some of the leftover delights of spring and all the early summer flowering. 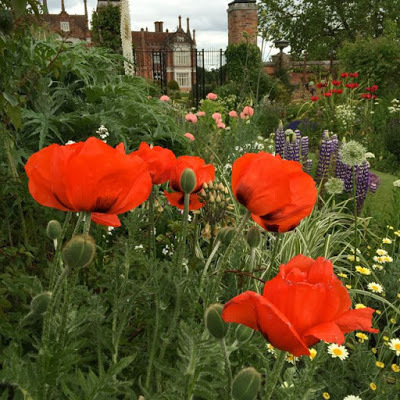 The semi-formal mixed borders were bursting with blossoming colour – peonies, poppies, lupins, alliums, tumbling roses and everything that makes up an English perennial border. These walled borders have been evolving since the garden was first laid out in the 1800’s and had a major makeover by the Tollemache’s in the 1990’s adopting the typical English romantic style of the 20th century (Sissinghurst being the most famous) – formal design with informal planting – the long borders have been broken up with buttressed, clipped yew hedges and the walls with espaliered roses. 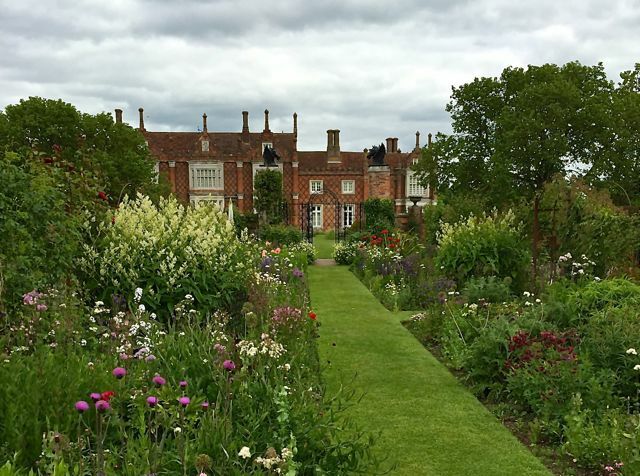 NOTE: Vita Sackville-West was influenced by other gardeners of the 20th century: Gertrude Jekyll, William Robinson, Edwin Lutyens, Lawrence Johnston and Norah Lindsay whom we will meet later at another wonderful garden that I visited on this trip. 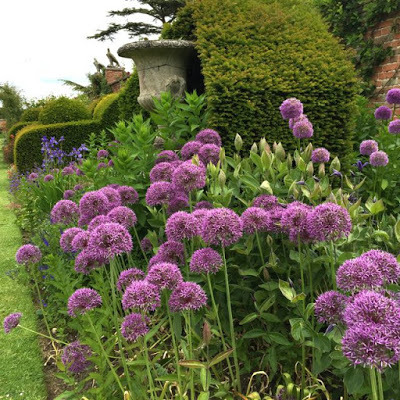 Alliums (onion family) in the long border with the buttressed yews – informal planting with structured design. Talking to the head gardener, he told me that at the beginning of the season the colour scheme in these borders is chosen to blend with the old roses; pinks, blues, mauves, lilac, creams and pale yellow, but as summer intensifies they give way to the stronger coloured bronzes, deep reds and yellows. A love of plants permeates a garden like Helmingham, with their personalities allowed to flourish. 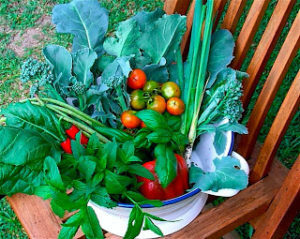 The abundant planting enhances shading of tender plants and encourages self-seeding – on the day we were there, a young lady member of the gardening staff was carefully moving some of these ‘opportunists’ that had popped up to spots in the sun where, as she said, “they would be happier”. The Parterre and Knot Gardens are a nod to the past in their Italianate and French designs originally made to impress and say ‘look how clever I am – I can control nature’ in their formal geometric design and proportion they were meant to look like an extension of the house and show off the owners wealth and status. The Parterre at Helmnigham has been softened by the planting of swathes of white and blue santolina and lavender – striking a contrast to the clipped hedges of box and yew. 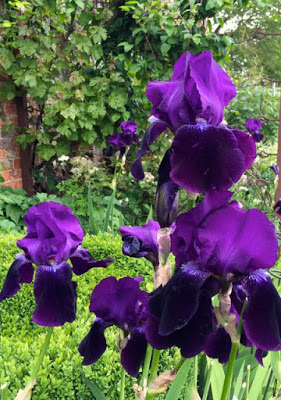 The garden also has an Apple Tree Walk, Rose Garden and walled Kitchen Garden – these beautiful iris formed a stunning border around the veggie beds – their iridescence glowing in the darkening day.The garden is open from May to September – check online for daily opening times. What was my favourite part of Helmingham? – the meadows around the house where I sat and ate my pork pie and strawberries. 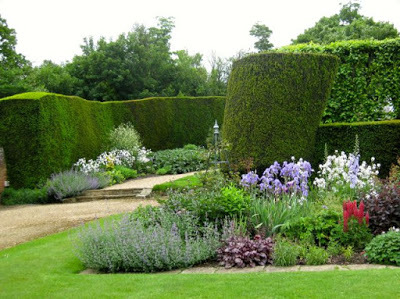 NOTE: On an earlier visit to the UK I visited the garden of Squerrys at Westerham and realised that not all garden staff have an eye for topiary and hedging – well, not a straight one anyway – either that or they take a hip flask to work with them!